Delectable ultimate chocolate cake with all the flavors of the Rocky Road candy bar; marshmallows and chocolate! I’ve been making this chocolaty-chocolate cake for about five years now, but only for special occasions. I think my son is the one who requested a chocolate cake topped with Rocky Road candy bars for his birthday one year and again this year, so this has become his cake. After experimenting with different chocolate cake recipes over the years, I now have the most flavorful, moist cake that has become my ‘go to’ recipe for chocolate cakes and cupcakes that I’m happy to share! This drool worthy cake is delicious, decadent, and divine! There is a a hint of cinnamon adding to the rich chocolate flavor which really adds a nice taste to the cake. Between the layers there is chocolate frosting and just a bit of marshmallow fluff, and then we top this gorgeous baby with ganache and chopped pieces of Rocky Road Candy bars. Hello, little bites of heaven! Each bite is very much worth every calorie, so run an extra mile or skip the glass of wine. Wait, scratch that. Don’t skip the wine because chocolate and wine is an amazing combination. Do what you need to do to enjoy this treat! Deal?!! 3 Rocky Road Candy Bars cut in small pieces for garnishing the top of the cake. Preheat oven to 350 degrees. Grease and flour two round 8 or 9" cake pans and set aside. 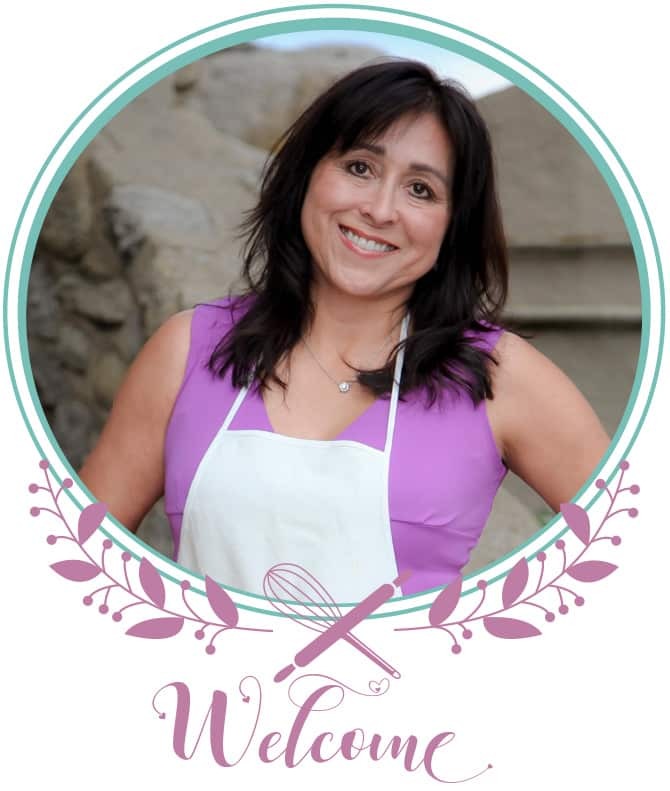 Whisk together in a large bowl, flour, sugar, and cocoa. Add oil, eggs and milk. Mix all ingredients well. Add 1 cup of hot water, combining all ingredients. The batter will appear to be too watery. Don't be tempted to adjust. It will cook perfectly. Cook for 30-35 minutes or until a toothpick placed in the center of the cake comes out clean. Cool cake completely. In a large bowl, whip butter and cocoa together until smooth. Stir in a pinch of salt, vanilla, and powdered sugar. Add milk one tablespoon at a time until frosting reaches desired consistency. Scrape sides and whip again until light, fluffy and smooth, 1-2 minutes. Put cream in a small saucepan over medium heat and let it get to the point where it's almost boiling. Add the chocolate and let sit for about a minute. Turn down heat so it doesn't boil. Stir with a rubber spatula starting from the middle, extending to larger circles until the chocolate is melted, about 2 minutes. Let the ganache cool at room temperature. Put first layer of cake on a platter or cake stand. Add a thin layer of chocolate frosting to the top, and then add a thin layer of the marshmallow fluff. Add the second cake layer and frost with chocolate frosting. 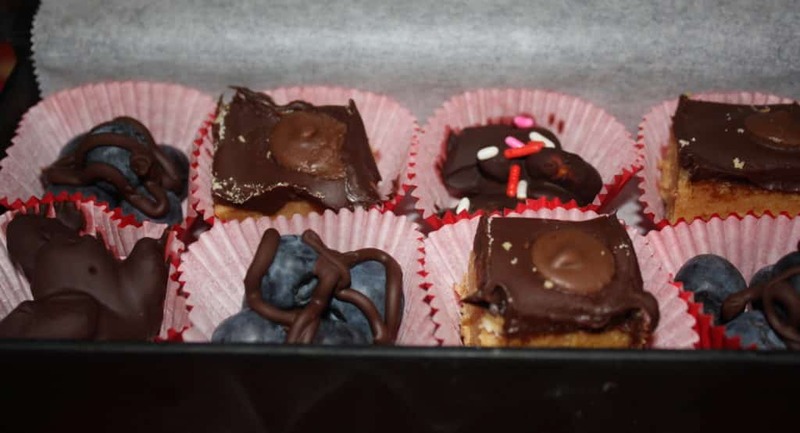 Top with ganache and add rocky road candy bars. Looking for a quick cake recipe with lots of appeal? Try Mom’s Refrigerator Cake from Kristin at Dizzy Busy & Hungry! OMG, I can’t resist this chocolately treasure. 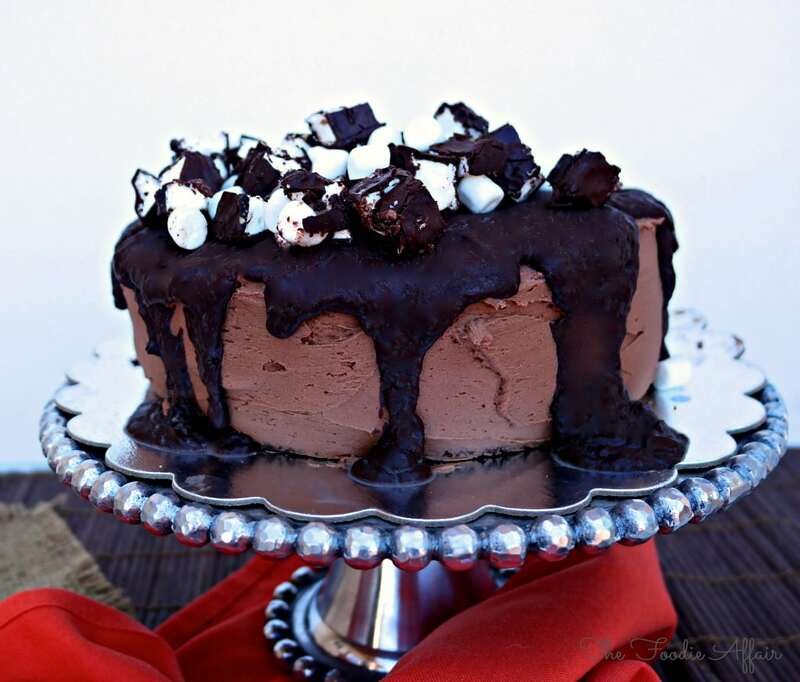 I love everything about this Rocky Road Cake. The cake, the delicious filling with the marshmallow fluff and then of course the ganache. I wish I had time I would attempt to give this a try right now – I will bookmark this for future. Thanks so much for sharing this delightful dessert. Pinned/shared. 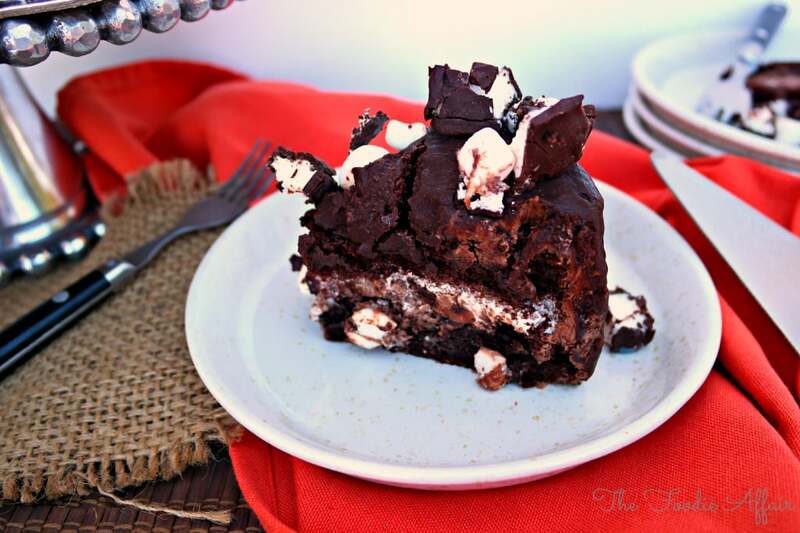 Your Rocky Road cake looks amazing! I’m definitely craving some of it right now! I can’t wait to try this! Thank you, Heidy! So rich and delicious. Thank you, Charlie! Not every store stocks the Rocky Road candy bars, and only had to try two places before we found a stash! This is a gorgeous cake, very impressive! I would definitely run a few extra miles just to have a piece of this cake! Love the marshmallow and frosting between layers. Oh yum, love everything about it! Yep! This scrumptious chocolate cake is worth every bite and the extra sweat too! Oh my goodness! This cake looks crazy amazing! 🙂 Love. Oh my word…how delectable! wow. a celebration indeed!! I’d probably cry with joy if someone made this for me for my birthday! haha You have a lucky family!! Oh my goodness!! This is my kind of cake!! Absolutely love this. Rocky road is one of my favorites. Isn’t rocky road the best. Simple flavors, but so tasty!! Oh wow, this looks like the ultimate decadent cake! I am going to request this for my next birthday cake! It is worth the extra mile (or two, or five!) I will have to walk to burn off the calories! Gorgeous cake! Love everything about it. I am sure the lucky birthday person loved it too…. I know I would have! Thanks, Mary Ellen. This cake is always a hit! 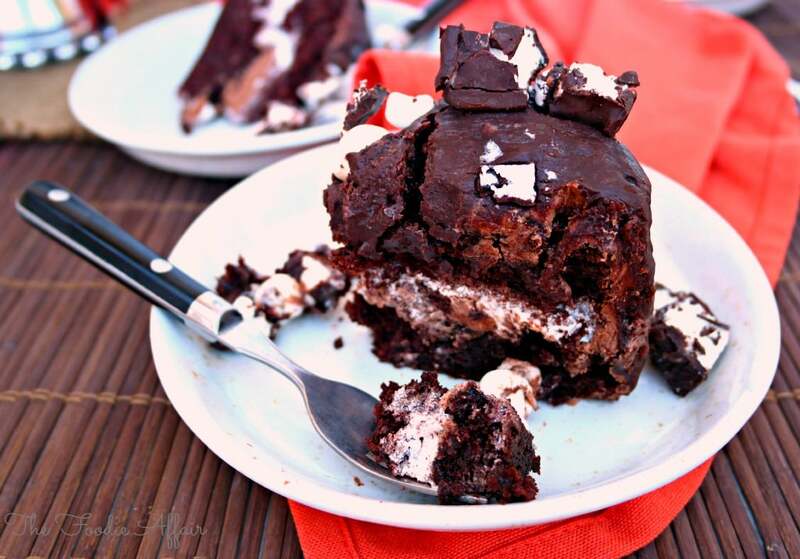 Rocky road cake sounds fantastic! I want some today. I’ll pretend it’s my birthday. Lol, we put a pretty good dent in it ourselves, but yes, you definitely need to share this cake! Thanks, Tammy! I have a slight obsession with cake stands. There are just so many pretty ones! Rocky road is my dad’s favorite, so I know what I will be making for his next birthday! Thanks this looks scrumptious! Oh, if your dad is a rocky road fan, this is the recipe for him! He’ll love it! 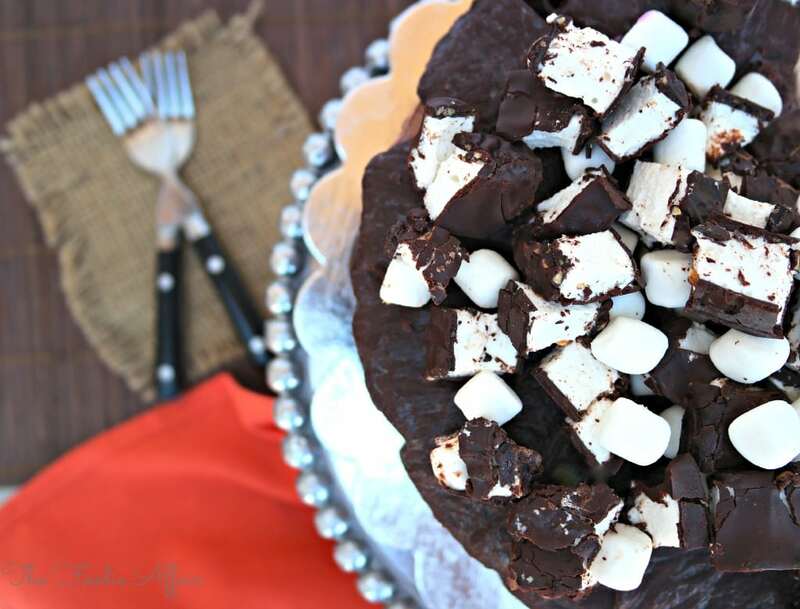 Oh wow, this Rocky Road cake would surely be a hit in our house! Thanks, Jessica! This cake is perfect served a room temperature!